To create a UserForm requires some programming, and you can see the steps in the videos shown below. For the written instructions, look below the videos. In this example, inventory data is stored on a hidden worksheet, where it is protected from accidental damage or deletion. Users enter inventory data by opening the UserForm, filling in the boxes, and clicking a button. To see the steps for creating a UserForm, please watch these 3 short video tutorials. The written instructions are below the video. 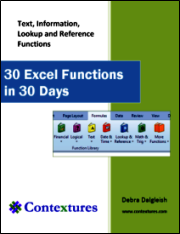 In the videos, Excel 2003 is used, and the same steps can be followed in later versions. When saving the file in Excel 2007 or later, save as a macro-enable file type. In part 1, you'll see how to create a blank Userform. Then you'll name the UserForm, and next you'll add text boxes and labels. In Part 2, you'll learn how to add buttons and a title on the UserForm. With buttons on the UserForm, a user can click to make something happen. For example, click a button after entering data in the text boxes, when you're ready to move the data to the worksheet storage area. In Part 3, you'll learn how to add VBA code to the controls, and you'll see how to test the UserForm. The VBA code runs when a specific event occurs, such as clicking a button, or entering a combo box. In this example, the user will click a button, and the VBA code will move the data to the worksheet storage area. In Part 4, you'll see the code that fills the items in the combo boxes. In this example, a parts inventory is stored on a hidden worksheet. In cells A1:D1, enter the headings for the parts inventory database, as shown at right. Choose File | Save, and save the workbook. In this example, the file has been named PartsLocDB.xls. NOTE: In Excel 2007 and later versions, save the file as a macro-enabled file type. UserForms are created in the Visual Basic Editor. In the Project Explorer, select the PartLocDB project. In the Properties window, double-click on the Name -- UserForm1, at the top right of the window. The form name will change in the Project Explorer, but the form still shows UserForm1 in its title bar. In the Properties window, double-click on the Caption property-- UserForm1. The title bar will display the new caption. The objects on a UserForm, such as buttons, and textboxes, are called controls. To allow users to enter data, you can add textbox controls to the Excel UserForm, with label controls to describe them. In the Toolbox, click on the ComboBox button. On the UserForm, click near the top centre, to add a standard sized combobox. With the new combobox selected, double-click on the Name property in the Properties window. (optional) Set the ColumnCount property to 2, if you want to see the part name listed with each part number. Click on an empty part of the Excel UserForm, to select the Excel UserForm and to display the Toolbox. To help users enter data, you can add labelS to describe the controls, or to display instructions. In the Toolbox, click on the Label button. On the UserForm, click to the left of the combobox, to add a standard sized label. With the new label selected, double-click on the Caption property in the Properties window. If necessary, you can resize the label, so it doesn't cover the combobox -- point to the handle on its right border, and drag to the left. Click on an empty part of the UserForm, to select the UserForm and to display the Toolbox. To allow users to perform an action, you can add command buttons to the user form. This form has a button to add data to the database, and a button to close the form. In the Toolbox, click on the CommandButton button. On the UserForm, click at the bottom left, to add a standard sized CommandButton. With the new CommandButton selected, double-click on the Name property in the Properties window. With the new CommandButton selected, double-click on the Caption property in the Properties window. If required, you can reposition the buttons by dragging them to a new location on the UserForm. To make the buttons perform an action, you create code that runs when the button is clicked. On the Menu bar, choose View | Code. This creates a procedure, where you can add your code. 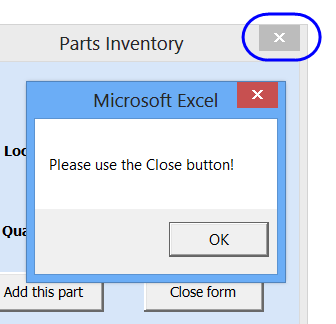 MsgBox "Please enter a part number"
On the Menu bar, choose View | Object, to return to the UserForm. When the UserForm is opened, there is an X at the top right. In addition to using the Close Form button, people will be able to close the form by using the X. If you want to prevent that, follow these steps. MsgBox "Please use the Close Form button!" Now, if someone clicks the X in the UserForm, they'll see your message. To populate the combobox lists, dynamic named ranges will be created in the workbook. Then, code will add the range items to the comboboxes, when the UserForm is initialized. In columns A and B, enter Part IDs and Parts, as shown at right, and in column E, enter a list of Locations. To create the drop down lists, you can loop through a list on the worksheet, as described below. Or, enter the list's range name in the combo box properties, as described on the Excel VBA ComboBox Match page. In the VBE, select the UserForm, and choose View | Code. To test the form, you can run it from the VBE. On the Menu bar, choose Run | Run Sub/UserForm. Press the tab key to move to the next control. When the boxes have been filled in, click the 'Add this part' button. Click the 'Close form' button, to return to the VBE. To make it easy for users to open the UserForm, you can add a button to a worksheet. In the centre of the worksheet, draw a rectangle, and format as desired. Go to the Excel window, and click the button, to open the UserForm. NOTE: While the UserForm is open, you won't be able to perform any other actions in Excel, such as entering data on the worksheet. You'll have to close the form first. 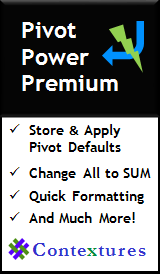 To summarize the data in the parts inventory, you can create a pivot table. Click Next, and click the Layout button. Drag the PartID button and the Part button to the Row area. Name the pivot table worksheet, PartsInventory. 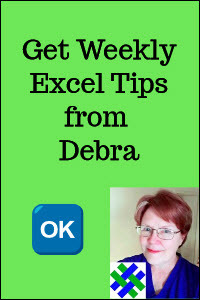 To make it easy for users to refresh and view the pivot table, you can add a button to a worksheet. To finish the workbook, you can hide the sheet that contains the database. Click the Click here to add Part Information button, and enter your data into the database.